sterilising | eat. drink. cook. travel. I like preparing for Christmas. There’s something about the smells of cooking festive goodies that add to the delicious anticipation of 25 December. 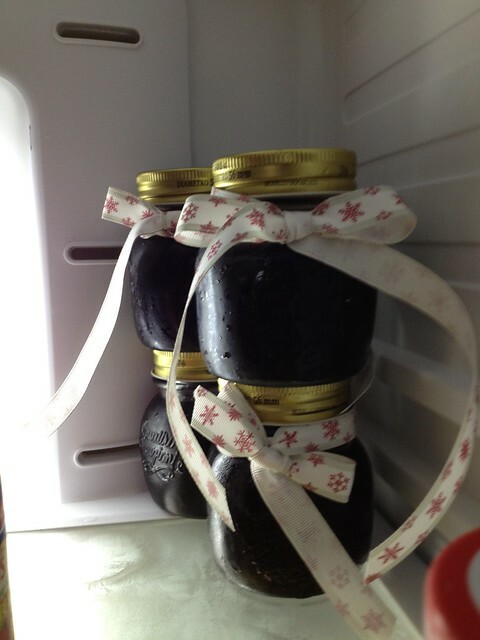 This year, I made red wine jelly for gifts. Reducing the red wine created a juicy berry and rather alcoholic fug that lingered about the house for a few hours. It’s a very simple because there’s no faffing around with peeling and chopping fruit. I just bought the cheapest bottle of varietal wine I could find – this meaning no anonymous “red table wine”. The supermarket had a shiraz and a merlot on sale for $16, so that was it. Here’s what the final results look like sitting in the fridge. Don’t they look adorable all dressed up with Christmas ribbon? I based my recipe on one from America’s Test Kitchen (log in required to see their recipe). Not having liquid pectin available, I substituted the powdered type. That first batch was far too sweet, although I liked the concentrated berry flavours from reducing about a third of the wine separately. The rest of the bottle goes into the actual jelly part, with pectin and sugar added, as is lemon juice for a punch of acidity. I added a drop of flavourless oil (in my case sunflower) to stop excessive foaming. This doesn’t mean that the mixture won’t bubble like mad. It simply means that the foam will go away, very important for a smooth top on your jelly. If you’re not interested in preserving and want to use the jelly quickly, like in the week or so, then jump straight to the recipe at the bottom. The rest is about how to preserve in sterilised glass bottles. One thing that people may not realise is that making preserves in Singapore isn’t easy because it’s hard to come by the right jars. The general advice is not to reuse them, or at least use new lids each time. Good luck on finding new lids for old jar. I ended up buying new ones. Proper jars with metal lids I got from Isetan ($2.50 or so per 150ml jar, more for the 300ml ones), with cheaper reinforcements from Ikea (4 for about $4). The problem with the Ikea ones are that the lids are plastic with metal paint on the top. Don’t diss them for being cheap, they’re still very smart all gussied up with Christmas ribbon. 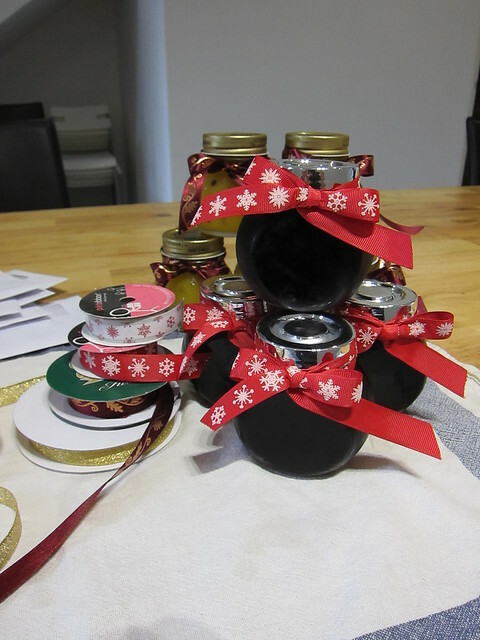 The second step to making preserves is to start sterilising your jars before you make the jam. There are various methods for doing it and I chose was I felt was most hassle free – using my oven. First I lined the base of a wire rack with some newspaper and put the freshly washed jars right side up, then set the oven to 150ºC. 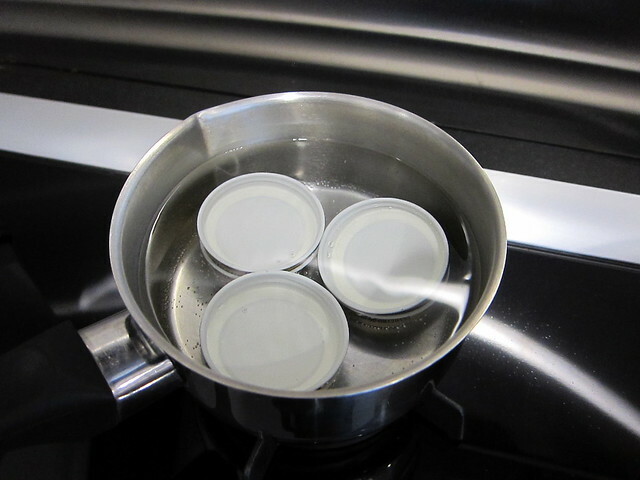 The metal lids I put in a pan of water and set it to boil. The plastic ones I left alone because I wasn’t sure if they would be able to withstand the heat of sterilisation. I just popped them on and hope the jelly still keeps. Once you’ve got your jars and lids going, get started on the jelly. Now carefully turn each bottle over – this is to ensure that the lids are screwed on correctly. Then leave to cool. If not screwed right, quickly turn right way up and sort out the mess if this happens (yup – been there, done that). 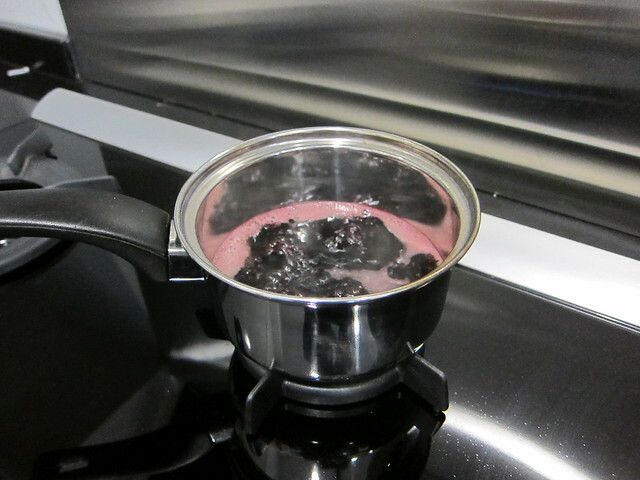 Rinse and reboil the lid, top up with whatever jelly you may have left, screw on the lid tightly. Then put this stray bottle back in the hot oven and leave for about 20 minutes. Remove and screw the cap on tightly, then invert and allow to cool with the rest. It’s not as hard as it sounds from the above passage. Just read through carefully and take your time for the first attempt. Ready for the recipe? Sterilise your bottles and caps (see preceding paragraphs). Reduce about a third of the wine (200ml if you’re measuring) in a small pan over medium heat till reduced to about 50ml or so. It takes about 20 minutes. In the mean time, heat the remaining wine on high, then mix the sugar and powdered pectin thoroughly in a bowl. Add the sugar-pectin mixture to the hot wine and bring to a rapid bowl. Add the drop of oil. Reduce the heat so it bubbles but not threaten to boil over. Stir occasionally for about 10 minutes or till you don’t see anymore pectin granules. Stir in reduced wine and turn off the heat. Pour into sterilised jars, cap, and allow to cool.